Summary: Unfortunately, this thriller doesn’t have that masterpiece’s satisfying complexity, playfulness or profundity. After the lacklustre Tears of the Sun and King Arthur (and the actually quite fun Shooter), director Antoine Fuqua returns to the more comfortable surroundings of the police thriller. His most popular film, Training Day, is instantly evoked here through the presence of Ethan Hawke and a subplot involving a rookie cop being shown the ropes by an older, more experienced officer. While there is plenty going on here, however, the whole film smacks of déjà vu. The three storylines play out over the course of a week. 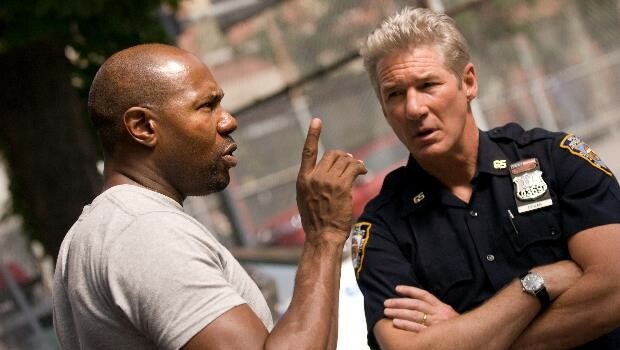 Richard Gere’s unremarkable and unpopular beat cop marks time before his retirement in seven days whilst trying to keep his alcoholism and relationship with a prostitute in check. Ethan Hawke adds Catholic guilt to his shouty, belligerent cop routine as a detective whose dilapidated house and growing family are prompting him to go to extraordinarily dangerous lengths to find money. Meanwhile, Don Cheadle is an undercover officer who has been infiltrating a drug gang (lead by the recently released from jail Caz, played by Wesley Snipes. Ahem) for so long that his duty to uphold the law is wavering. Unfortunately, these strong actors are saddled with box-checking character clichés of such magnitude that even their performances cannot overcome the inevitabilities of their arcs. Gere’s cop is lumbered with a rookie partner with one week to go before retirement and is also given the scene in which he tries to get his prostitute girlfriend to leave town with him. Hawke’s conflicted cop is unlikeable and his character trajectory is predictably clear from the second he appears on screen. Cheadle fares worst. Groans are likely to be elicited in the age-old scene in which, walking away from his superior who is apparently working to get him out of this undercover job, he is told that if he does this ‘one last thing’, he will get his life back. This one last thing is, of course, to nail Caz who has become like a brother to him. The entire first half strains under this infection of seen-it-all-before-avitis. Between The Wire, The Shield, The Departed and even Training Day itself, Brooklyn’s Finest is simply in no position to offer anything new. The film even features two actors from The Wire, a decision that invites unfavourable comparisons. The second half of the film is slightly better as the three desperate officers converge in a series of showdowns in the same apartment block. Thankfully, Fuqua downplays the coincidences enabling each character’s fate to pack at least some wallop. None more so than Gere who quietly emerges as the star of the show. It’s an understated, unshowy performance walking the line between pride, regret and cowardice as he fights back the urge to get involved with anything that could jeopardise his impending departure. Brooklyn’s tree lined, brown-brick streets are captured with authenticity, showing that Fuqua still has a knack for shooting in an urban milieu. But for all its gangs, violence and street talk, Finest’s tracking shots, incessant score and converging timelines and characters strangely recall P.T. Anderson’s Magnolia most of all. I’m all for an Altmanesque police epic. Unfortunately, this thriller doesn’t have that masterpiece’s satisfying complexity, playfulness or profundity.